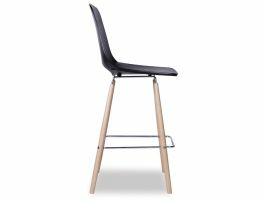 With a distinctively modern flair, this black barstool offers a polymer seat and beechwood legs with a chromed steel frame and footrest. 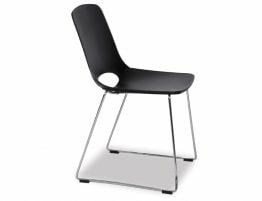 Offered in two barstool sizes, a 68cm kitchen bench height and a 77cm commercial bar height, the Wasowsky modern black barstool offers a great black commercial barstool or the perfect modern black barstool for your home kitchen. Breathe new life into your spaces with these chic contemporary barstools by Enrique Marti Associates for OOLand. 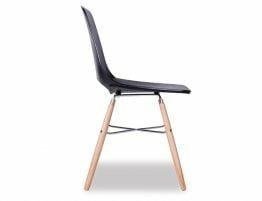 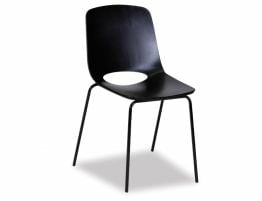 Whether you are looking for designer black barstools for your modern kitchen bench dining or chic and easy to care for black commercial barstools for your restaurant or lounge, this black plastic barstool offers the ease of a clean looking polymer seat with the warmth offered by the use of European beechwood. 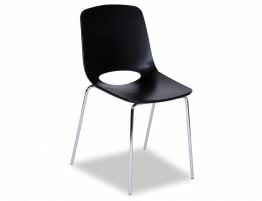 The Wasowsky is also offered in a dining chair in the same style and colour range if you want both barstools and chairs in the same style.